The internet is full of hilarious videos of a woman saying “Hello Fraands! Chai Pee Lo.” Somvati Mahawar’s videos have gone viral overnight and people have started tagging their friends and family on social media who loves to drink tea. Foodpanda, the online marketplace for food delivery caught on and made use of this viral video in their own unique way to market their chai on the platform. Foodpanda surprised its customers by sharing this post, “Hello Fraands! Chai Pee Lo” and gave options to choose from where they can have a cup of tea. 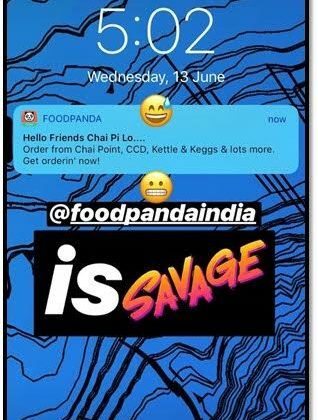 In no time, Foodpanda became a hot favourite just as the humble chai. Today, marketing is considered to be the backbone of any brand operations. “It is essential to take your messaging to the end consumers and break the clutter for them while providing them with recommendations which are relevant to them,” said Anshul Khandelwal, Head of Marketing, Foodpanda. “We at Foodpanda keep our eyes on everything that is viral or topical. This video and the memes related to it have been trending on the internet for some time now and what’s better than connecting it with our consumers’ never ending love for chai on the platform,” he said. “It is almost criminal not to be updated on social media in this day and age. Whether it is 25 years of Jurassic Park, Sunil Chhetri’s triumph, IPL or Chai Pi Lo, we have always spoken the language of internet and tried to connect with our users with quirky engagement on social media,” he further added. With these quirky style of communication, the company present their users with a wide variety of dishes on their platform. The company also expects increase in business as the monsoon season is approaching and there are famous traffic jams (pun intended) for delivery all over the city. Foodpanda Uses Hello Fraands! Chai Pee Lo Viral Video to Market their Product 0 out of 5 based on 0 ratings. 0 user reviews.